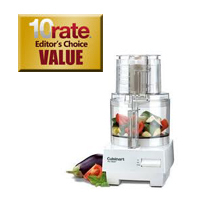 A medium-size appliance for an affordable price ($99.95), this Cuisinart food processor has the power to handle complicated tasks while still small enough not to take over all your counter space. It cuts food into fairly uniform pieces and kneads and mixes bread well. As long as you feed food into it a bit at a time, you won’t overload it or strain the motor. For a food processor, it’s not horribly loud, which is always a plus. Overall, we were impressed with this mid-size model’s capabilities and amazed at the very reasonable price.